Beginning with Berlioz and Cesar Franck, there is a continuous tradition of western-european music, mainly French, which in contrast to the more reputed central-european one and its emphasis on the note and the symbol, places more importance on materiality, the tangible reality of the sound itself. The spectral use of the octaves, the veils of sound, the nuances, the “en dehors” interpretation of Debussy, with the chords - timbres and chords – resonances of Messiaen, find their logical continuation in a music which places the natural phenomenon of sound in the center of artistic creation – in a radical dispute with the established paradigm, a music which, assisted by science, replaces the work from the field of relations and proportions to the primary level of perception and cognition. Born in Athens, Maria Aloupi showed her remarkable abilities in piano and generally in music very early on. Starting from the age of 4 years old, when she performed in public for the first time, she gradually established an ongoing, regular contact with the audience of at least one to two performances annually. However she will not be consumed in an typical early career thus allowing her skills to mature and her musical personality to deepen and expand. Her continuous study of the musical practice, her constant contact with the repertoire also through her participation to numerous chamber music ensembles alongside her extensive teaching experience, contributed greatly to that end. At the same time she will further her studies which will be concluded in 2001-2002 under Halina Siedzieniewska – Alberth in Munich, with her active participation of in the “Seminar on performance practice of works for keyboards by J.S.Bach” in Leipzig under Robert Levin, as well as her collaboration and apprenticeship next to Gerard Pape, the seminars by K. Stockhausen in Kuerten and the summer Academy of the Centre de Création Musicale Iannis Xenakis (CCMIX) in Paris. 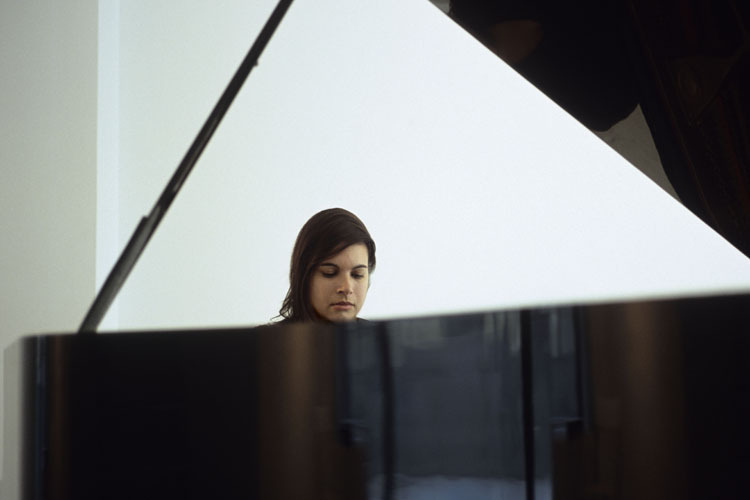 One particular characteristic of her aesthetic, also directly connected to her work as a composer, is the emphasis she places on the exploration of the pianistic timbres not only from the technique's point of view but in her approach to performance practice as well. Involving a meticulous gradation of the appropriate tone color’s ranges in the execution of each piece, she appropriately highlights its structure in its totality and equally in the individual elements that articulate it. Her programs are daring and highly original. Often based on thematic concepts or the interchange with other art forms, they usually propose a dialogue between the works of the Canon with less celebrated (or even unjustly forgotten) works of the Classical and the Romantic period as well as an extensive repertoire from the 20th and 21st centuries. Her main consideration in planning a program is the achievement of an overall structure in each concert and the emergence of the affinities and routes that connect the presented works in question. As the Artistic Director of the Center for Music Composition and Performance (2006) and the cofounder of ABOUT: Cultural Venue (2010), she has organized, curated and promoted more than 120 productions that cover a wide range of art events.